You are going to Watch Naruto Shippuden Episode 317 English dubbed online free episodes with HQ / high quality. Stream Anime Naruto Shippuden Episode 317 Online English dub Shino vs. Torune! After escaping from the Shinobi Alliance, a reincarnated Torune finds a place far enough to execute a unique kinjutsu to his abilities. However, Shino is able to find him with his kikaichū. Notified from Torune’s position, Shino starts a battle in order to stop Torune’s kinjutsu. Once face to face with him, Torune asks if Shino made any friends, thinking back about their shared past. When they were little, Shibi was Torune’s guardian after Shikuro died, Torune and Shino growing to act as siblings. Torune showed him his insects, and saved him from going to the Root by volunteering himself. Torune explains that he never thought he would get a friend like he did in the Root, Fū. In the battle, Torune takes advantage from his taijutsu learned at Root, unleashing a accurate kick to Shino’s stomach. One of Naruto’s clones appears and saves Shino from falling into Torune’s kinjutsu. 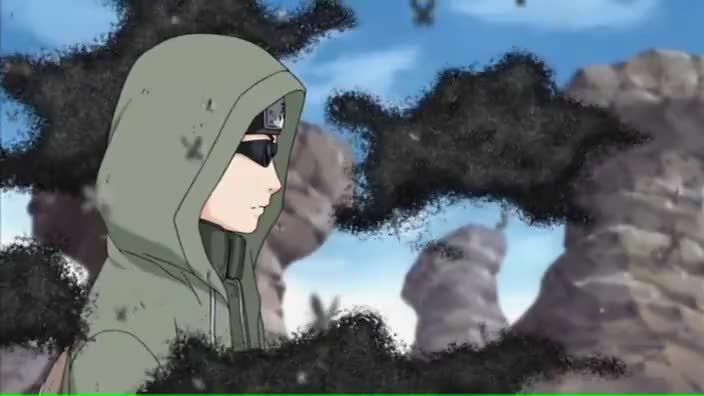 Shino shares his knowledge about the opponent’s abilities, warning Naruto to not touch Torune’s skin, thinking the only way his insects could spread their poison. Torune uses his Poison Cloud Justu to attack them from a distance, but it is blocked by Shino’s insects. With the warning to not touch Torune’s skin, Naruto starts fighting the reincarnated opponent, who tries to use kenjutsu against him, though Naruto succeeds in breaking his sword. Naruto manages to land a Rasengan, and Torune almost lands a punch on him, failing due to Shino putting himself in between them, taking the hit. Torune is confused that Shino isn’t suffering the effects of his venomous insects, and Shino reveals that his punch hit Shino’s insects, which Shino has bred with Torune’s own insects after he was recruited into Root. This allowed them to build up a resistance against their venom. Shino uses these insects to paralyse Torune, and applies a sealing tag, stopping him and his kinjutsu.